Workers' compensation benefits are available in every state to employees who have been hurt within the scope of their employment. The Florida worker’s compensation statute prescribes that employers with upwards of four employees must carry insurance for employees’ work-related injuries. Employers are further required to pay the entire cost of the insurance premium, thereby taking the financial burden off employees. Should an employee become injured on the job, the worker’s compensation insurance provides for payment of medical bills and wages foregone as a result of the workplace injury. Workers' compensation programs are “no-fault.” This means that injured employees can receive benefits without the need to prove that the accident causing the injury was someone else's fault. In Florida an estimated 100,000 workers are injured on the job and apply for benefits each year. The State of Florida Workers Compensation Program covers a wide range of injuries arising from accidents as well as job-related illnesses, including occupational illness or diseases occurring over a period of time as a result of exposure to hazardous substances, environmental conditions, or repetitive body motion. State statutes govern the benefits available to you, set limits on amounts awarded and time limits for filing workers compensation claims. 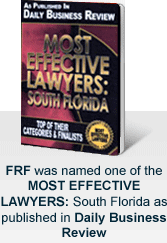 You should consult a workers compensation attorneys in Fort Lauderdale if you have any questions concerning workers' compensation, and especially if you have been injured and your employer refuses to pay benefits. An attorney can explain the Florida workers compensation rules related to your injury, protect your rights and ensure you receive the benefits to which you are entitled. At the law firm of Friedman, Rodman & Frank, our legal services include extensive skill in workers' compensation claims litigation. For more than three decades our lawyers have successfully handled Florida workers' compensation claims involving accidental injuries, work related deaths, occupational diseases and repetitive motion injuries. If you are a dependent of someone who died from a work-related injury injured, or you have been injured and the employer or the insurance carrier refuses to pay benefits, call our law firm at 877-448-8585 . We will be glad to evaluate your case, at no cost to you. All of our attorneys and support staff speak Spanish, and we can also communicate with you in Creole and English. An attorney is available 24 hours a day, 7 days a week to take your call. Sé Habla Español / Nou Parlé Creole.